If gin depresses you, then this show is just the tonic! 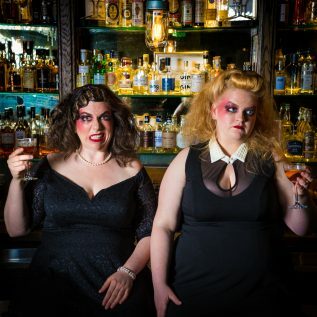 Mother’s Ruin: A Cabaret About Gin is, as you may have guessed, a cabaret about gin. Performed by the spirited Maeve Marsden and Libby Wood, the show is an intoxicating 60 minutes of history, songs, anecdotes and recipes. Wood and Marsden concocted the show with fellow writer Elly Baxter, who runs a website called The Ginstress. Their fascination led them on an expedition into the dark and seedy past of the demonised clear spirit, back to 18th century London when relaxed tax laws led to the proliferation of small distilleries, an abundance of gin and an epidemic of alcoholism. “There were horror stories of women getting drunk and neglecting their children…” says Marsden. Desperate for a return to sobriety, the authorities disseminated propaganda and insinuation about women who had fallen into disrepute and abandoned their families – hence the term “Mother’s Ruin” often used to describe gin. Marsden and Wood also discuss different gin varieties, including some boutique Australian brands made with botanical natives. The play list is a compilation of gin or drinking themed songs, or songs that have been modified for purpose. Fever, for instance, has been altered to describe symptoms of malaria (which was treated with tonic water). Their show in Sydney, Hot Gin Punch, is a fund raiser to help them take their act to England and the Edinburgh Fringe. The night will resemble a speakeasy party with gin cocktails (sponsored by Four Pillars Gin), menu items created by head chef of Bloodwood, surprise guest performers, parlour games, photo booth, and dancing. People are encouraged to dress up. And, as Marsden points out, thanks to Sydney’s lock-out laws, it will have an authentic prohibition era feel! Jul 7, 7pm. Giant Dwarf, 199 Cleveland St, Redfern. $36/42 (includes complimentary G&T) Tickets & Info: www.mothersruincabaret.com; NB: 18+ only.